In 2016 the Foundation was able to assist a former cavalryman who had been stricken with ALS. The cavalryman and his family were renovating their house to make it wheelchair accessible so that the entire family could remain in their house. While the VA assisted with some of the construction work, our Foundation was able to cover some of the additional costs that the family was facing. The Second Dragoons Foundation is proud to have made another contribution to the SSG Brian Freeman scholarship fund in 2016. This marks the 8th annual contribution by the Second Dragoons Foundation. SSG Brian Freeman was killed in combat in Iraq in November of 2005 while on duty with the 3rd Squadron of the 3rd Armored Cavalry Regiment. SSG Freeman was killed when a vehicle-borne improvised explosive device detonated near his dismounted patrol in Baghdad. Also killed were 1LT Justin S. Smith, SPC Robert C. Pope II, and PFC Mario A. Reyes. The SSG Freeman scholarship was established by SSG Freeman’s family to provide college funding for one student per year who graduates from SSG Freeman’s former high school, Caledonia High School. Students compete for the scholarship by writing essays concerning what our country or military means to them. The EE Mixon Second Dragoon Foundation recently provided funds to helped a Cold War era trooper and his family get back on their feet in the midwest. The family, who have teenage children, were evicted from their home and needed a little help to get back to normal life. We are proud to help those who served in the cavalry, no matter the era. The Second Dragoons Foundation is proud to have made another contribution to the SSG Brian Freeman scholarship fund in 2014. The EE Mixon Second Dragoons Foundation has provided funds to a heroic Iraqi interpreter who moved with his family to the USA. This interpreter provided mission critical support to Cavalry troopers in Iraq. Later this interpreter and his family were threatened by Iraqi insurgents for his connection to the US Cavalry. Once he moved to the USA with his family, we have helped him find work and set up a home. We are proud to have provided help to this Cavalry hero. 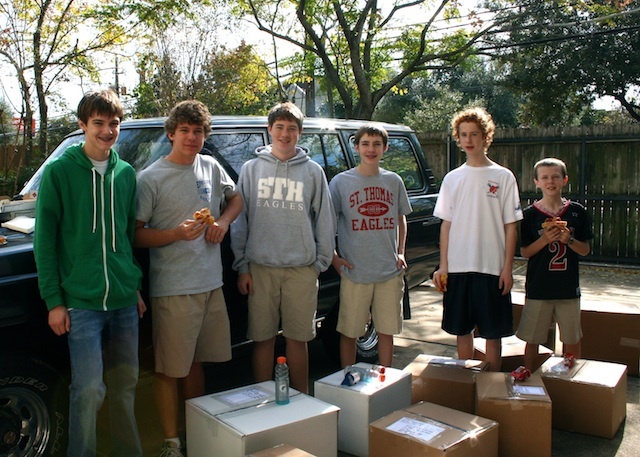 A group of Houston students have continued their annual tradition of collecting goods to send to US troops in Afghanistan for the third year in a row. They collected ten boxes of care package goods (trail mix, socks, beef jerky, paper back books, etc.). Eight high school sophomores participated (picture of six below). The goods were sent to a Stryker platoon at an outpost near Kandahar (part of 25th ID). The EE Mixon Second Dragoons Foundation is proud to have provided funds (~$400) to ship the boxes to Afghanistan. Thanks go to Daniel Farley and friends for continuing their tradition. Most of all, thanks to our troops serving in Afghanistan and we hope these Care Packages make life a little more bearable for them. The EE Mixon Second Dragoons Foundation is proud to announce its 2011 selections for scholarships. This years’ winners are Christine Nussio, Victoria Inman, and Matthew Begay. Congratulatons to all three! With their permission, we are printing their winning essays below. Following the joyful days of triumph at the victory of the Allied powers in 1945, most expected to see a new era of peace and freedom enjoyed globally. However, less than a year later Winston Churchill, one of the leaders of the free world, warned that the Iron Curtain had descended on Europe condemning millions to lives of fear and oppression under Communist rule. For half a century the world would witness another struggle of global proportions between the free world and totalitarian power, the Cold War between the Soviet Union and the United States of America. From the conclusion of World War II, American forces stood guard in Europe on the fringes of the Iron Curtain to provide stability, security, and hope that Communist dominion would end at last. These US service members stood firm in the blockade of Berlin in 1949, for example, maintaining an airlift for nearly a year which kept the city from surrendering to Soviet pressure. As American and Communist forces clashed in Asia or vied for strategic positions through more diplomatic means, the American forces maintained their watch in Europe down to the late 1980s when Soviet power began to wane. It was during this time that the front lines of this effort were the armored cavalry regiments (ACR): 11th ACR and 2nd ACR. These regiments were stationed in the Federal Republic of Germany (FRG) with the 1st and 3rd Armored Divisions, and the 1st, 3rd and 8th Infantry Divisions to ensure the security of free West Germany against the Red Army of the Soviet Union, and the forces of the Communist government of East Germany. The troopers of 2nd and 11th ACR maintained continuous guard and border duty patrols throughout the Cold War, 365 days a year. Their task was to provide advanced warning of an approaching Communist attack so that the other divisions which were stationed further back could respond to the threat. My father has stories of these times, such as when he and his unit manned OP Alpha in Rasdorf, FRG while the 11th ACR went through its annual gunnery exercises in 1989. It was this continuous training and vigilance of the American cavalrymen and soldiers which displayed American resolve through several crises during the Cold War. Having a well-prepared, capable, and ready force at their disposal in theatre, gave the United States’ leadership the confidence to take a firm hand during periods of Soviet belligerence. Moreover, this determined military presence showed the Soviets that the United States was not willing to back down in the face of Communist threats or allow further Red expansion. The presence of American cavalrymen, soldiers, and other service members in the European theatre was a physical manifestation of their country’s resolve throughout the Cold War. It was this resolve which sustained the free world through the darkest moments of the Cold War and brought liberation to the inhabitants behind the Iron Curtain. The Cold War was not an actual war. It was more of a giant argument between two different types of governments, the Communists and the Democratic governments. It started in 1945 right after World War II ended. The Communist nations began to quarantine themselves away from all other European nations by building fences and walls, the most famous being the Berlin Wall. The USA and the Soviet Union never fought each other. For many decades, the USA did not intervene directly with the USSR – not until the 1980s when President Ronald Reagan came into office and launched his campaign to end Communism in Europe. The USSR was suffering from a poor economy, and it was the perfect time for Reagan’s administration to act. President Reagan created the Reagan Doctrine, which allowed the U.S. to add more political, economic, and military pressure on the unstable Soviet Union. Meanwhile, Germany was still divided between Western Allies and Communists. It was not until the removal of Hungary’s border that the metaphorical “Iron Curtain” was breached and other Communist countries began to lower their iron curtains. After much protesting, the East German government finally allowed free passage to West Germany and Berlin, and the wall eventually fell. This event led the East and West German governments to discuss a reunification plan, and in 1990 the East Germans allowed for a free general election. These elections eventually allowed both governments to form a Treaty of Unification, which united all regions in Germany. The region formerly known as East Germany joined the European Union and NATO. This officially ended Communist rule in Germany. Germany may have fallen, but the Soviet Union still existed. President Reagan and Soviet president Mikhail Gorbachev discussed ideas for Soviet independence. Eventually, many protests began and Gorbachev called for a reconstruction of the Soviet government. With the counsel of his friend, President Reagan, he slowly turned the country away from Communism. Once the Ukrainian Republic voted for independence, the rest of the Soviet Union collapsed. On a December morning in 1991, Gorbachev announced his resignation as President of the Soviet Union, declaring that the position and nation no longer existed. After this, the Council of Republics formally declared the end of the Soviet Union and announced the birth of the Russian Federation. Soon all the other Soviet satellite nations formed their own countries and governments, and Communism no longer existed in the European continent. In conclusion, the United States had a huge influence on ending the Cold War. The intervention and presence of the U.S. Armed Forces helped greatly to prevent military build-ups in the Communist nations. The Cold War probably never would have ended without the U.S. military presence and help of our government. Many brave, dedicated men and women served our country during this time period, and all of President Reagan’s hard work paid off with the eradication of Communism from Europe, thus ending the Cold War in 1991. The Second Dragoons Foundation is proud to have made another contribution to the SSG Brian Freeman scholarship fund in 2011. Daniel Farley and some of his Houston buddies sent Care Packages to 2nd Stryker Cavalry Regiment in Afghanistan. The E.E. Mixon Second Dragoon Foundation helped with the shipping costs.